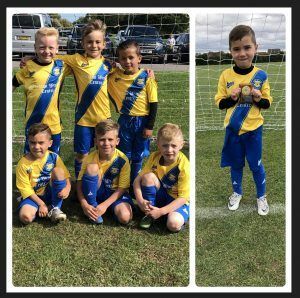 Under 7 Yellows started this game without goalkeeper Dylan Pruden and little Georgie Lambert so started this Game with Fin Connor between the sticks. In windy conditions and playing against the wind the game was a little scrappy but sparked to life when Oliver Gibbon intercepted a stray pass and played a well weighted ball to Archie Martin who took a touch and played Kian Earl in on goal who struck an unstoppable shot into top right corner to give Stockton an early lead. The rest of the half was fairly even with neither sides creating many chances of note but a lapse in concentration meant the Newton Aycliffe player was able to tap into an empty net to level the scores and meant the teams were tied at the break. The second half started with Oliver Gibbon going in goal meaning Fin Connor went back to his favoured midfield role and he made an immediate impact straight from kick off catching the opposition defence sleeping he struck a right footed effort which the goalkeeper done well to keep out but Archie Martin followed in and made no mistake to put the yellows back in to the lead. Stockton were now starting to find there rhythm and were playing some good football, when Finlay Connor picked the ball up on the left hand side he beat the Aycliffe defender and played in Archie Martin who made it 3-1 to the visitors. Stockton were now starting to dominate the game with some fantastic football Archie played the ball into Fin who then beat three defenders with some excellent footwork and struck the ball in off the right hand post to make it 4-1. The Home side were now starting to tire playing against the wind and with Archie pressing from the front he forced the Aycliffe defender into a mistake and put the game out of reach to make it 5-1. With Thomas Lowe not letting anything past him at the back Owen Carberry moved into midfield and played a ball out wide to Kian Earl who in turn found Owens run and he scored to make it 6-1. Owen was enjoying his more advanced role and with five minutes remaining the ball fell to him just inside the opposition half and with a first time half volley he found the top left corner to finish off the scoring and make it 7-1 with a strike that will be a goal of the season contender. In the yellows first game all boys played there part and were a joy to watch in difficult conditions, any of the boys would of deserved it, but with his constant work rate and well taken Goals Archie Martin was named Player of the match. The boys now move onto cup action next week with a home game vs Hartlepool pools youth Blues.